The 'ESS' is a dog for all seasons, an endearing energetic companion for the owner who is willing to give it the time that it deserves. Highly thought of by the police as sniffer dogs, well known in the field trial world for their tireless enthusiasm, many a rough shooting man's friend, a joy to behold when moving round the show ring in their own distinctive style 'all his own', a wonderful family pet & a good companion for young & old alike. Do not run away with the idea though that this breed is a paragon of virtue however, the breed standard states "Symmetrically built, compact, strong, merry, active. 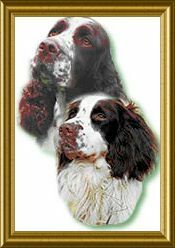 Highest on the leg & raciest in build of all British land Spaniels", Strong, merry & active are the 3 important words here & it should be remembered that this is a breed that was developed to work, therefore Springers benefit from, & must be being trained, be it for a formal discipline or merely to take its place in the family home. All puppies need time & a lot of patience & Springers need as much as any other, perhaps a little more than some of the less energetic breeds, but they will reward you with love & devotion, not to mention a great deal of fun, providing you give them the right grounding. They are equally well suited to living in the town or country so long as you have a well fenced yard &, once they are grown, the time to exercise them both in body & mind. As with any other breed of dog 'ESS' IS NOT recommended to anyone who is planning to be out all day leaving the dog on its own; dogs are pack animals & therefore do not take kindly to solitary confinement & Springers do NOT do well left alone. They can be a 'high maintenance' breed time wise due to their constant need to be with you ~ then there is the coat & grooming required to keep this dog looking as good as it deserves! Do remember that 'ESS' vary considerably in size & appearance, dependant on the purpose for which they are bred. It is important, therefore, that you decide what you personally require from your 'ESS' & then purchase a puppy from a reputable breeder, whose dogs fit those needs as closely as possible. As with any other breed there are a few hereditary problems which you should be aware of prior to purchasing a puppy. See our 'ESS Health' page for more details. Make sure to find a reputable breeder who will be only too happy to discuss these with you & whose stock has been tested. The 'ESS' is registered in it's country of origin with The Kennel Club (UK) & is listed as being one of the ‘Top 10' most popular dogs in the United Kingdom. The breed is registered with the Australian National Kennel Council (ANKC) within Australia. He is a medium sized dog of moderate substance. He is loyal, relatively docile, but always willing to do anything asked of him. In general, he is of equitable temperament, with a willing heart, warm dark & appealing eyes & ever wagging tail. He can mean all things to all people from whatever walk of life they might come. 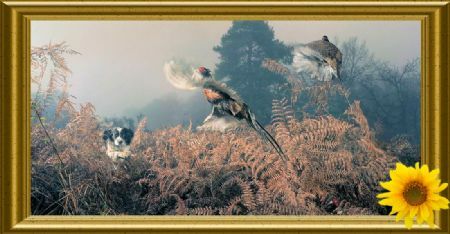 His ability to work as a Gundog in the 'Field' has always made the Breed appealing to the shooting fraternity, but he is equally as popular as a 'rough shooting' companion ~ & generally considered to be the best 'rough shooting' dog in the world ~ or with his energetic and endearing personality, as a household pet, where his happy & very biddable temperament lends itself well to family life. For the most part, his main in aim in life is to please, adoring as he does the company of both humans & other animals with whom he may work or live. Over the centuries the Breed has evolved so that it can now fit into any role chosen for it that suits its personality, however, as mentioned earlier this also means that the breed falls into 2 distinct 'types' of ESS ~ i.e. the ‘working type' & the ‘show type' - both types make equally good family pets & are equally well suited to living in the town or the country, as long as there is a well fenced garden & they are regularly exercised. The ‘show type ESS' is a little larger than the ‘working type' & with more substance to its make-up i.e. bone & body - conforming more towards the description in the ANKC Standard. His popularity as a show specimen can be seen by the success of the Breed with several 'ESS' having been winning for many years in top competition both in the UK, Europe, the USA, Asia, NZ & of course, Australia. The ‘working type ESS' appears smaller in size, has a high ear carriage with the length of ear appearing shorter than the ‘show type' ESS, & is usually of a lighter overall substance showing its suitability for the agility & versatility required as a working gundog. Both ‘types' of 'ESS' have the same coat colours i.e. liver & white, black & white or either of these colours with tan markings. As most people just want a ‘pet' it would be a good idea firstly to make sure you find out all that you can about the Breed & decide which lines you want ~ 'show' or 'working'. Whilst initially one breed of dog, the mid 20th century saw the 'ESS' beginning to divide into the 2 distinct lines known to us today as the ‘Show' Springer & the ‘Working' Springer Spaniel. Contrary to the description ~ you don't have to show the 'show' type nor do you have to work the 'working' type ! Some people might find the ‘Show' type ESS more aesthetically pleasing & consider them to have a more 'laid back' attitude whilst still proving to be highly intelligent, totally biddable & always ready for fun. The 'Working' type ESS has a keen sense of smell, coupled with high working ability & endurance. Both types, however, have the instinct to work & can be trained to the gun ~ & both types can make very good pets. Average life expectancy of the English Springer Spaniel is 12 ~ 14 years. The Breed's versatility can be seen in many walks of life, other than the ones for which he was originally bred. He is the popular choice of the Emergency Services, Customs & Excise & Armed Forces for enhancing all aspects of their work. 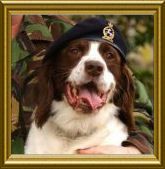 In December 2004, ‘Buster', the English Springer Spaniel received the 'Dicken Medal', the highest award for animals serving the British & Commonwealth forces in war. This is the animals' version of the Victoria Cross (VC). The medal is inscribed: ‘We Also Serve'. 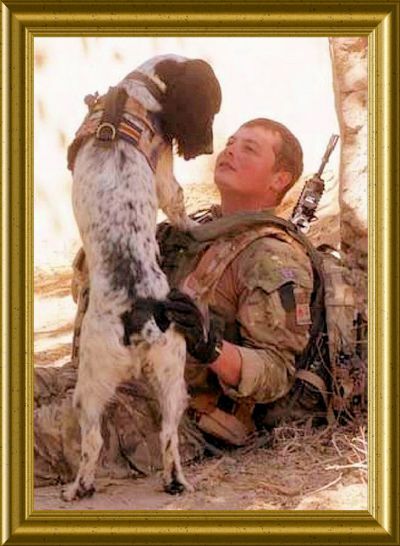 "On October 25th 2012 the English Springer Spaniel 'Theo' was awarded the 'PDSA Dicken Medal', known as 'the animals Victoria Cross', at Wellington Barracks, London. Lance Corporal Liam Tasker, 26, was shot by insurgents on March 1st last year whilst on patrol in the Helmand Province with his ESS dog 'Theo', who died of a seizure (possibly 'heartbreak') shortly afterwards. The pair, who were said to have been inseparable, detected a record 14 Taliban roadside bombs & weapons cches in just 5 months, & are belived to therefore have saved countless lives. Their role was to provide search & clearance support, uncovering hidden weapons, improvised explosive devices & bomb-making equipment". The 'ESS' also takes part in many other canine related activities such as Obedience, Tracking & Agility where he can provide a lot of fun & interest both for himself & his owner. For the most part it is his ‘sense of fun' (everything is a ‘game' ~ literally ~ to the English Springer Spaniel) that makes him successful in all these varying fields of canine activity. However, you would not see many 'ESS' refusing to curl up in a comfy chair, dog bed or warm kennel to sleep at the end of a busy day.